Designer Alex Papachristidis is known not only for his elegant interiors but his layered and luxurious entertaining style. Incorporating collections and decorative art onto his tables, Alex’s settings are colorful and creative works of art. So it came as no surprise that he created a glamorous new home collection for Moda Operandi. 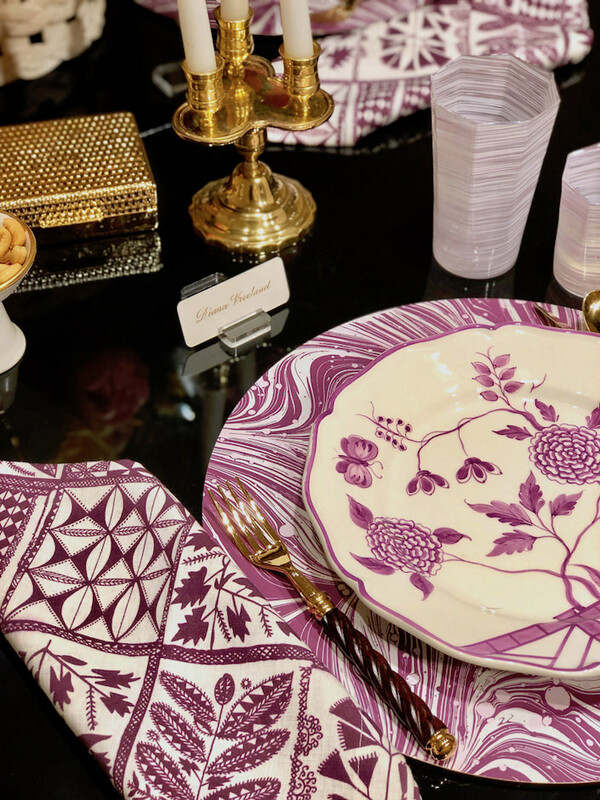 As you may remember from Susanna Salk’s and my Setting the Table video with Alex at his chic New York City apartment, purple is a neutral in his book, which has extended into the covetable new collection. 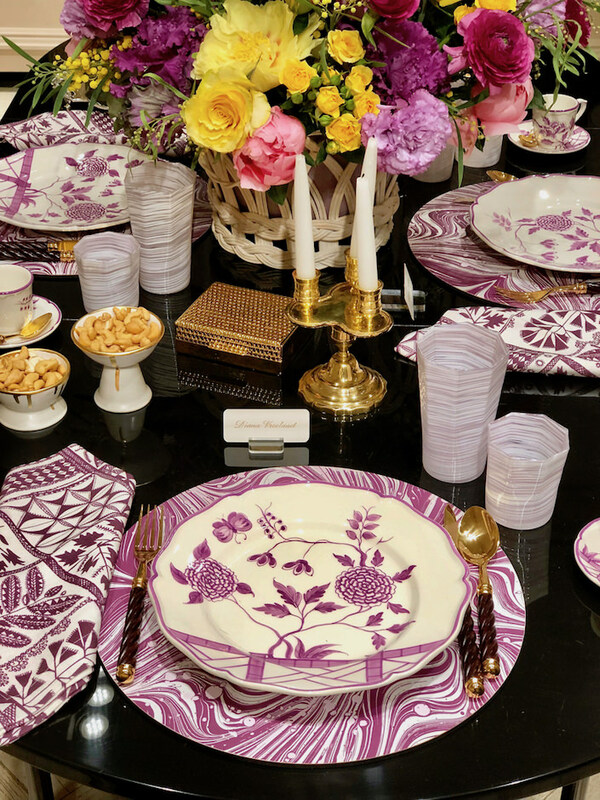 Above his Le Jardin Chinois dinnerware in a plum hand painted floral that is casual enough for every day but easily dressed up for more formal affairs. 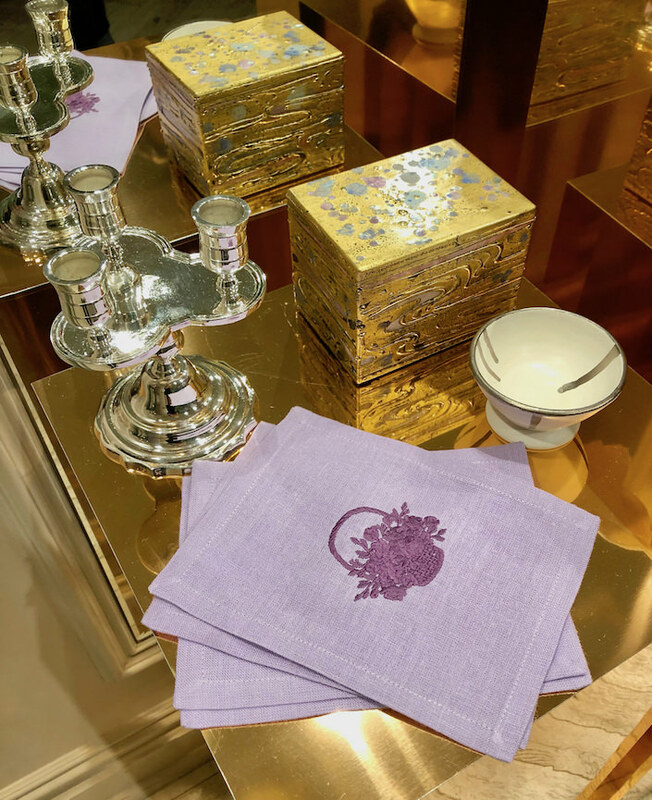 Teaming up with favorite manufacturers and vendors, Alex collaborated on items in patterns and/or colors exclusive to Moda Operandi, such as the Venetian Lavender Placemats by Tisch New York, or Alain Saint Joanis gold plated flatware, above. 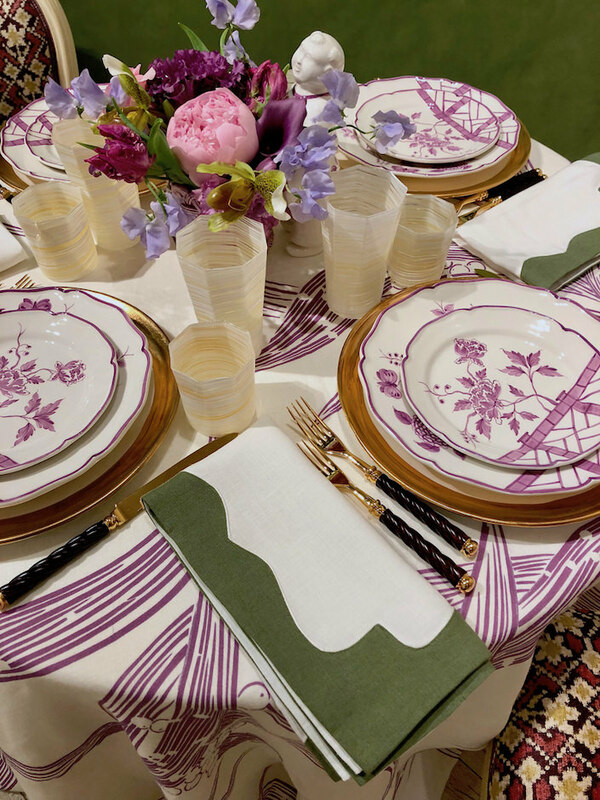 Don’t be surprised if you see the fabulous lavender Oak Spring Trellis napkins, a graphic plant and leaf pattern named after Bunny Mellon’s iconic Virginia estate, on one of my tables soon!! Also inspired by the legendary tastemaker is Bunny’s Basket, a spectacular handwoven and antiqued white wicker cachepot. 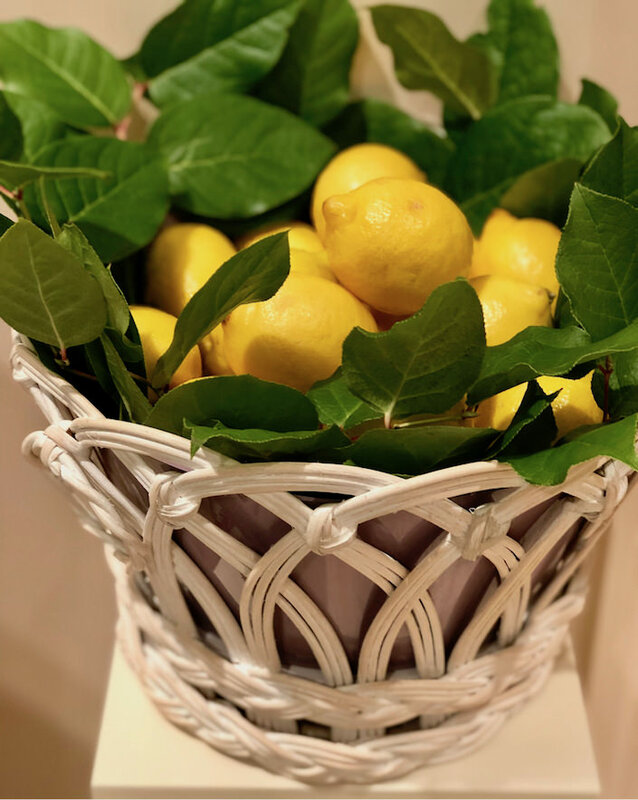 Based on a basket Alex owns from Bunny Mellon’s collection, it features a lavender fiberglass insert, filled at the trunk show with a glorious arrangement by Zeze, above, and lemons, below. I spied friend, designer Ashley Whittaker nabbing these gorgeous Hollywood Regency Garden Dinner napkins in a generous 22″ square (I have a pet peeve about small napkins). And there are matching round placemats in the same charming scalloped pattern. Alex partnered with Gracie to produce the beautiful Enchanted Lavender Leaves tablecloth above. 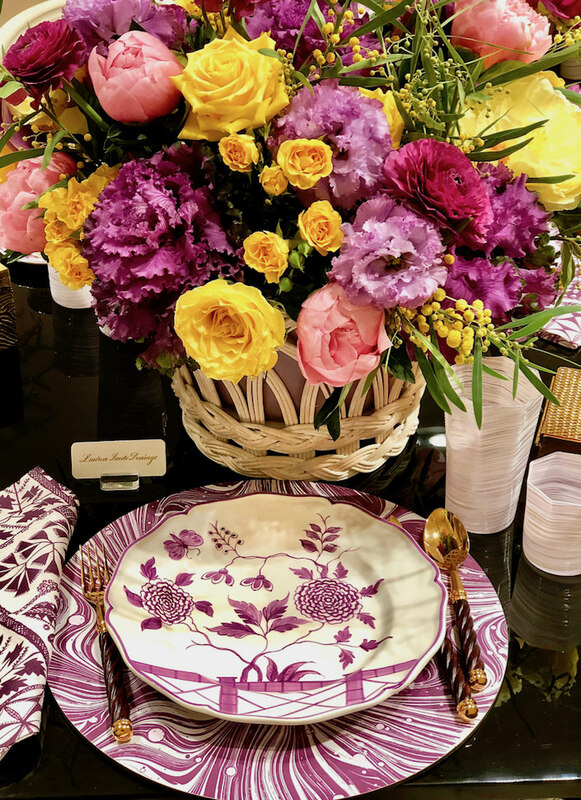 You may remember the outstanding one Gracie produced for Alex’s Lenox Hill Gala table a couple years ago and the dazzling designs they collaborated on for Alex’s Kips Bay Dining Room. 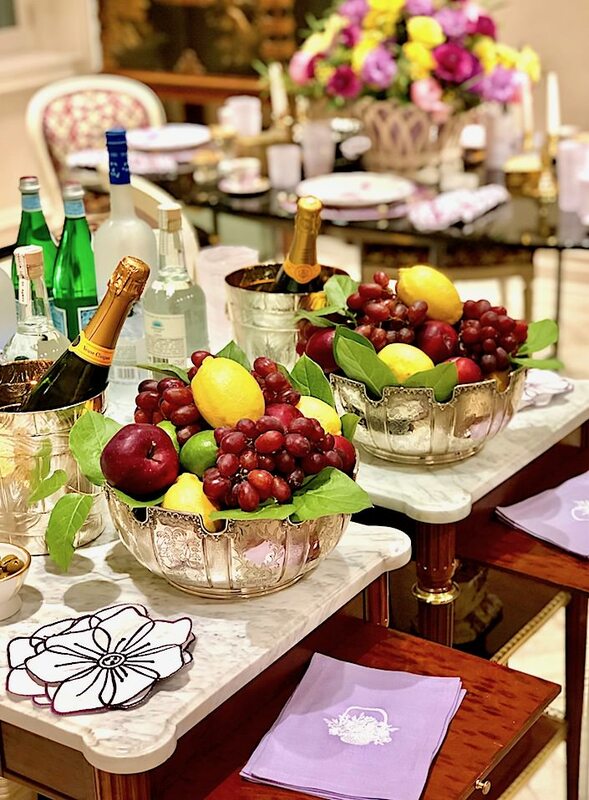 Leontine Linens is another longtime favorite and owner Jane Scott Hodges collaborated with Alex to make these charming Basket Full of Flowers Cocktail Napkins, above. The marvelous Petit Candelabra is produced by Victoria & Son from an old 18th Century French mold and can be take apart to use as three romantic dinner candles. Alex had it made in both silver gilded (above) and polished gold finish. The exquisite one-of-a-kind gold and pearl box is a creative collaboration with artist Nancy Lorenz, whose work you can often find in Alex’s projects. 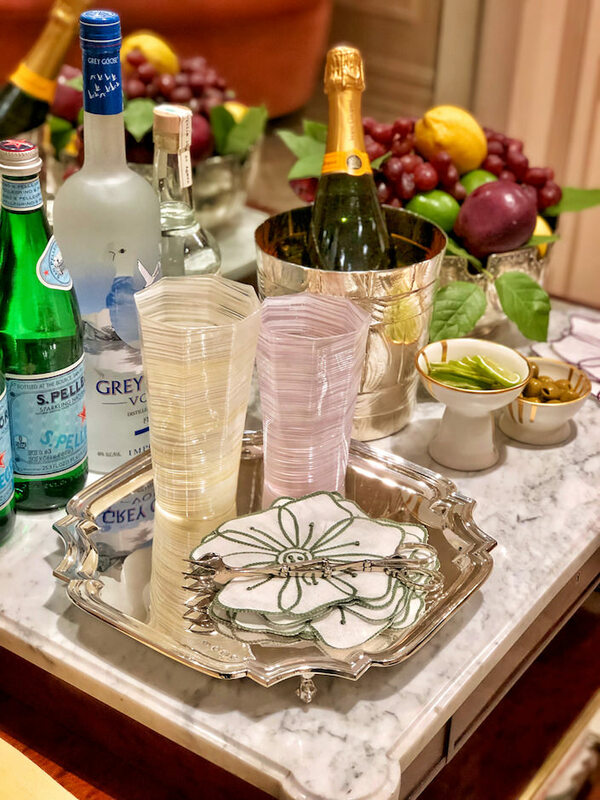 Alex set up charming vignettes throughout the space including this bar featuring several of the exclusive sterling silver pieces commissioned for the collection – the Mona tray and a particular favorite, the Faux Bois ice bucket (or wine cooler) in back, handcrafted in Paris. Everything featured (minus the alcohol) is part of the trunk show – the Homespun Venetian glasses (made in America), vintage sterling ice tongs, Plucked Peony Cocktail Napkins, Dripping Gold porcelain nut dishes (also perfect as salt cellars) and below, 18th c. inspired sterling chinoiserie bowls that are Tiffany custom orders made in the UK with English hallmarks. This is merely a look at some of the many products that are a part of the trunk show collection. Be sure to take a look at the other offerings on the Moda Operandi site. And as we all get ready for holiday entertaining, stay tuned next month for a new Setting the Table with Alex video from his home in the Hamptons! This entry posted in design, gifts, interior design. Entry Tags: Alex Papachristidis, Moda Operandi, Tabletop, trunk show Bookmark the permalink. Alex is a tabletop genius. Palette is perfect. Charm pervades. No one entertains more beautifully or demonstrates such flair. What wonderful decorative objects, the plates and bowls are like a work of art. I think they’re good at design and functional as well. Lovely color combinations and design ideas. 80 queries in 0.712 seconds.